The Wright Wreport: As 'Mortdecai,' Johnny Depp Is a Jolly Good Fellow and So Say All of Us! As 'Mortdecai,' Johnny Depp Is a Jolly Good Fellow and So Say All of Us! 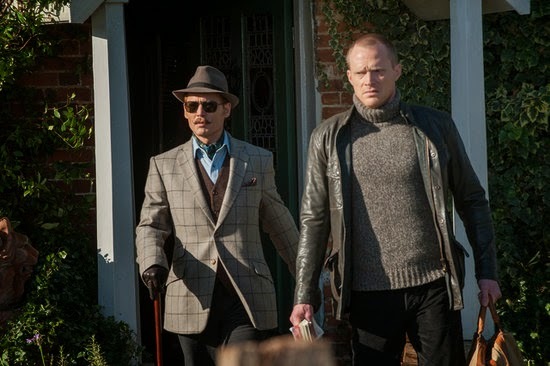 Mortdecai (Johnny Depp) and his man, Jock Strapp (Paul Bettany), in "Mortdecai." Photo courtesy of Lionsgate. ONLY a cursory observation will reveal that Charles Mortdecai and Captain Jack Sparrow are kindred spirits. Both are a bit flighty and mischievous, yet thoroughly lovable. If the names of these gentlemen are familiar it is because they are characters played by Johnny Depp. The latter, of course, is the dodgy man in command of pirate ship, The Black Pearl, in the “Pirates of the Caribbean” film franchise. The former is an impoverished English aristocrat and the title character of JD's latest film. “Mortdecai” opens today in U.S. theaters. Like so many members of the British peerage, Mordecai has a huge estate but not enough coin to properly maintain it. You know, all those generations of wastrels, womanizers and woeful gamblers. Alas, this art dealer and womanizer must do the most vulgar thing – work for money … well sort of. Mortdecai reluctantly accepts a mission for the Crown. Specifically, he must take himself off on an all-reasonable-expenses paid trip to a dreadful place called Los Angeles to recover a stolen painting. It is valuable, but not owing to its artistry. And yes, retrieve said painting, return it to its rightful place, all while avoiding elimination by marauding Russians and sundry other threats to his person. In many respects, “Mortdecai” is a fish-out-of-water story, for much of the humor is derived from the title character's reaction to the great unwashed as well as the dreary Americans. (See video below). The film has been widely panned. Already, in some corners there is talk about it being a shoo-in for the Golden Raspberry Awards. Scuttlebutt has it that JD may have a Razzie Worst Actor nomination in his future! This is not very sporting. Of course, “Mortdecai” is not high art and has its flaws, mainly around pacing, violence and situations of a sexual nature. Let us not quibble, though. The film does not aspire to greatness. The message appears to be, "have a few laughs and go on about the rest of your day or night." JD is the film. He is the sun and the planets – aka his costars – orbit him. Gwyneth Paltrow (Venus) is delicious as his self-possessed, blonde wife, Johanna. As Inspector Martland, Ewan McGregor's (Saturn) straightman, is wonderfully supercilious. The standout among the support, however, is Paul Bettany (Mercury) as Mortdecai's valet Jock Strapp. Yes, that is his name. No doubt, JD and PB – costars in “Transcendance” and “The Tourist” – have formed a bromance. In “Mortdecai,” their interactions are strongly reminiscent of that of Hugh Laurie and Stephen Fry in the delightfully droll “Jeeves and Wooster” British dramedy television series. It is based on P.G. Wodehouse's "Jeeves." tales. Back in the day: Johnny Depp as Office Tom Hanson in "21 Jump Street." Archive photo. But this is JD's film – he is also a producer – and he delivers. Consider the source, though. Yours Truly has been a JD fan since “21 Jump Street.” All of these years and films later, my favorite JD film is “Edward Scissorhands,” the actor's first collaboration with another man with whom he clearly has a bromance – Tim Burton. At last count, (“Dark Shadows”), they've made eight films, for better or worse. But I digress. JD is laugh-out loud funny as Mordecai. Even his detractors must give him credit for great comic timing. And imagine the hours of coaching involved in maintaining that particular strain of a British uppercrust accent. It is a cut or two above BBC English. Consider, too, the practice involved in getting just right the mannerisms of a popinjay such as Mortdecai – a product of centuries of the idle rich, very possibly the result of inbreeding. There are other little nuances, such as authentic insouciance, that JD grasps with ease. Here is an extremely difficult performance that this oddball actor has made look effortless. “Mortdecai” achieves its goals – to be fun and funny. Well-done, old man. “Mortdecai” is rated R for some language and sexual material; visit http://www.mortdecaithemovie.com/ to learn more about the film.